When looking back on 2017, three particular brands acted as the influential triumvirate around which everything else appeared to rotate: Gucci once again led the luxury pack, Mango cornered the hipster-on-the-high-street market and Ganni held a steadfast position as the contemporary brand creating each season's must-have pieces (whilst never becoming ubiquitous or over-priced). Not once has this Danish label done what we expected them to, and never before have we seen such a varied stream of cult items in just 12 months. Recalling just how much Team Who What Wear UK has charted Ganni's stratospheric rise to fashion fame—and as the news arrives that a major private equity firm is taking a strategic investment to see the brand grow globally—we wanted to know: Just what is their secret? I caught up with the masterminds behind the label to learn more about the success of this fashion girl–approved brand: creative director Ditte Reffstrup and CEO Nicolaj Reffstrup. Keep reading to find out all about Ganni. 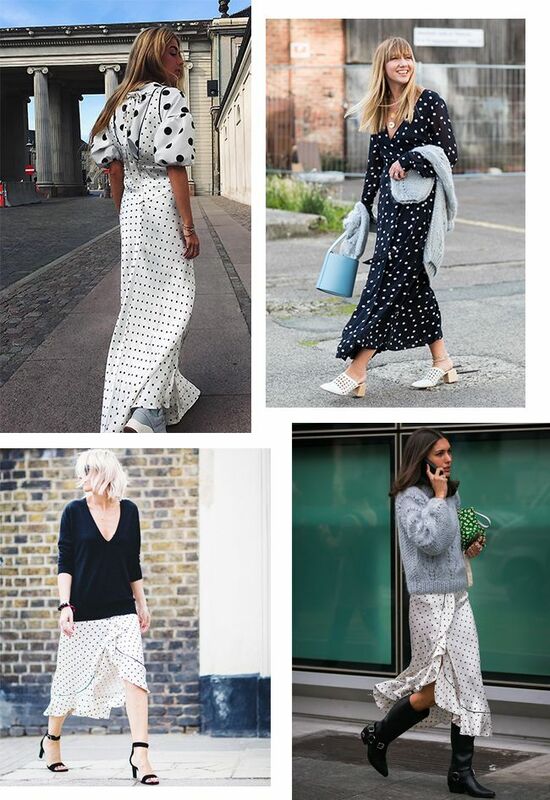 Emili Sindlev, Lisa Aiken, Diletta Bonaiuti and Emma Rose Thatcher all wearing Ganni's polka-dot prints. So you can probably recognise Ganni from 50 paces. Perhaps you even own a Ganni piece (or more). You may even follow the #GanniGirls hashtag on Instagram as closely as we do, but how much do you actually know about the brand itself? Well, you might be surprised to discover that the label started way back in 2009, and in a very different capacity. "I don't think you could call it a brand [at that time]. A friend of ours who had a gallery was doing clothes here and there, and I just suspect mostly it was what he kind of liked rather than trying to put together a proper collection, so in that sense it was a little random," explains Nicolaj. "Ditte started working with him, helping him out, developing a style, designing a pair of shoes and things like that, and she went on to become very successful for him. So at that point we started to kind of join the company." Ditte saw this opportunity as a chance to finally create the clothes that many cool Copenhagen girls in her circle and beyond felt they were missing. "I would describe Ganni as a very Scandinavian or very Copenhagen-ish brand—a very effortless, laid-back, cool style. People often have a picture of Scandinavian style as either very premium or very androgynous, and that was actually why I wanted to do Ganni, because I thought that something was missing in Copenhagen. I could not recognise myself in those two descriptions," she explains. And so, Ditte set about establishing the kind of mix and match prints and sporty ratios that have become the DNA of this trend-setting Danish name. The famous "Yellow" T-shirt from S/S 16. Net-a-Porter alone has placed 10 substantial re-orders of Ganni stock this year, quadrupling the investment since they first picked up on the brand for A/W 16. A similar story goes for another key stockist: Brownsfashion.com. The London boutique also introduced the Scandi label that season, following the Instagram frenzy surrounding a seemingly simple £60 T-shirt emblazoned with a banana and with the word "Yellow" spelt out in clear caps across the front. "Their fruit-printed T-shirts were a clear indicator of the popularity of the brand—they were an instant sell-out," Jennifer Bishop, womens wear buyer at Brownsfashion.com says. Ditte agreed that this particular collection provided a real turning point: "I put the T-shirt on a girl who had never done a show before. She had never been outside Sweden! But I found her at a model agency—she was the only bald, shaved-head girl I could find—and so she took the train from Malmö to Copenhagen and I put her in it with a beautiful lace skirt and sneaks, and even though we had big models like Nadja Bender, people went mad about this girl." Nicolaj quickly chimed in and I'm hastened to agree: "It was more the outfit!" Ganni's mohair Julliard sweater, worn by Elsa Hosk, Marie Hindkaer-Wolthers, Laura Jackson and Camille Charrière. Although this year has seen a legion of stylish women shift into peak Ganni mode, for insiders the love started quite some time ago. The #GanniGirls hashtag, for example, actually first hit social media in 2012 when Kate Bosworth and Helena Christensen added it to a joint Ganni-clad selfie. "We picked up on that hashtag and we've been using it ever since," says Ditte. "A lot of people resonated extremely well with that." And thus, a pandemic of this kind of tagging was born: How many other brands can you think of that have followed suit? Despite the high profile A-list names that were early onto supporting the label (Gigi, Kendall, Rihanna), you can sense the buzz Nicolaj and Ditte get from seeing real girls choosing to buy, wear and share their Ganni moments. "I love when I see people wearing Ganni—and I can see that it's easy for them, that they are working, that it's okay to wear sneaks with a long floral dress … When I see people in Ganni, it makes me very proud and happy, and I think people look cool," says Ditte, explaining that their team often repost pictures of girls in their garments not because of how many followers they have, or how supposedly influential they might be, but because they like seeing their pieces in action. "Ganni has definitely cultivated a loyal and notable 'tribe,' with fashion editors, influencers and street style stars all wearing and adoring the brand. It’s a brand with huge visibility, having been seen on so many cool women," says Bishop. "Their strong influencer following is a real testament to the product—these women really want to be #GanniGirls and I think this really shines through in an age where influencer dressing initiatives are not always quite so organic." As Copenhagen Fashion Week started to attract an international crowd a few seasons back, certain industry movers and shakers were fast to pinpoint Ganni as the standout name to be shipped overseas. "I remember the first show: The 'Tennis' show. I didn’t know what to expect—I was so nervous. I’m always very nervous before a show, and that hasn’t changed at all, but I remember that Justin O’Shea [the former fashion director of mytheresa.com] was in the front row, and that was like a big thing for us," says Ditte. "That was a very big thing for Copenhagen Fashion Week. He got interviewed by this national TV show and they asked him what he thought of the show, and he didn’t say much—he just said 'it was epic.' I'm almost starting to cry again … I was so proud of us and the team because he was a guru at that time." Since that point NAP, Brownsfashion.com, Liberty and Selfridges are just a few of the major stores to join mytheresa.com. Ganni's Charron checks worn by Lucy Williams, Sofie Valkiers, Adwoa Aboah, Jeanette Madsen and Emili Sindlev. So as you can see from the imagery and supporters above—added to the many other pieces we've reported on or featured this year, such as the beaded pouch bags, platform sneakers, track pants and rainbow knits—there must be a magical method to Ganni's continued success, right? "I try to stick to my gut feeling, and for me, I'm designing 24 hours [a day]. When we finish a show I will always go on an inspirational trip the day after, it is an un-stopping process … I never think that I do stuff well enough—I always want to be better and better!" Ditte says. But it's also down to the fact that as a business, they know that working with "scarcity" (as they call it) creates buzz: For example, a pair of pink shoes we were all hyped up about this week was only produced in 100 pairs worldwide. Unsurprisingly, they sold out fast. "That particular shoe has a two-week lead time because it's a European manufacturer—so we could easily redo it and have it restocked, but we don't do that," explains Nicolaj. "We are extremely picky about our distribution—for a brand at our price point we could, I guess, double sales if we wanted to by widening our distribution." Instead, the team evaluates what's selling, and elaborates on those winning moments—generating different iterations to satisfy demand whilst ensuring that each Ganni girl still feels unique. The goal is to make the customer feel that she's made the right choice, whether she's armed with a smaller budget and investing all of her earnings into an ultra-flattering wrap dress (an item that appears to provide the bulk of sales for retailers) or she's a wealthier consumer looking for constant updates. "We don’t have something like the Birkin bag or a product like that that’s been the same forever—and people expect that dynamic from us. We are also about newness, there’s no doubt about it," says Nicolaj. "Rather than hiking prices up to get closer to luxury as a lot of brands desire, we’d rather work with limited runs and tweaks and injections." Ganni's alternative florals have also been a hit on the streets in their many different forms. But before you mistakenly think this is a brand run on analytics, know that the now-adored mohair Julliard jumper (which is £350, hand-knitted in Italy and takes a great deal of time to manufacture) wasn't even a runaway success the first time around. It's a perfect example of the gut feelings that lead Ditte through her design process. "[It] was actually very much a design thing that we really wanted to pull through," says Ditte. "And the first time we only sold very very few, but then it suddenly became something that people really appreciated—the handiwork, the colours—and suddenly it has become a commercial thing, so we will do it for each collection but in different colours and it’s a classic for us now." One additional and vital force behind Ganni's far-reaching appeal is the democratic way in which Ditte and Nicolaj run the business. "Ditte is very consensus-driven, and it’s a very dynamic process on the design team. I believe we maintain a very flat hierarchy and we generally are just nice to each other and listen to each other!" says Nicolaj. Ditte and the team head off on inspiration trips after each show to find new ideas, and she notes that much of their combined creativity is down to a lot of talking, as well as switching off from the daily grind and the noise of social media. As for where she'll travel next, the "gut feelings" that propel these two through the industry is leading them to consider opening three stores. London and New York are top of the list so far, but it's all about finding the right space. Do you know any estate agents? I'd sure like to have them put a good word in. Coolest when worn with flats or trainers. These are on sale. Act fast. Our deputy editor just bought this elegant number. A cheeky take on our shopping addiction. Party trousers you can wear to work with a white shirt. It's back—but don't expect it to wait around for long. For the girl who doesn't do biker jackets. Wear it in winter with tights, boots and a chunky knit. These alternative cowboy boots are already gaining popularity. Next up, the big street style trends you'll see everywhere in 2018.